It became a common and welcome sight: patient “Carl” tooling up and down the hallway with his IVEA. Six or eight times a day the middle-aged, Texas hospital patient would ambulate on his own, his health steadily improving until, as his nurses described it, he walked himself out of the hospital. And in this particular unit, Carl’s experience isn’t unusual. Six months into a comprehensive IRB study to determine the IVEA’s effect on several key elements of care, one of the most promising results is a significant increase in the number of semi-independent patients becoming independent and able to ambulate without caregiver assistance. While the hospital will collect data for another six months before releasing a full report, there’s little doubt that the IVEA is having a measurably positive effect on care. Preliminary study results also show a reduction in the number of patient falls and falls with injury, even though more patients are walking more often. It’s exciting to be able to affirm the IVEA’s value with hard data, but it’s not simply the equipment itself that’s making the difference. The hospital unit involved has taken several definitive steps to optimize a study that took many months to launch. First, they committed to replacing every IV pole in a 36-bed unit with an IVEA. 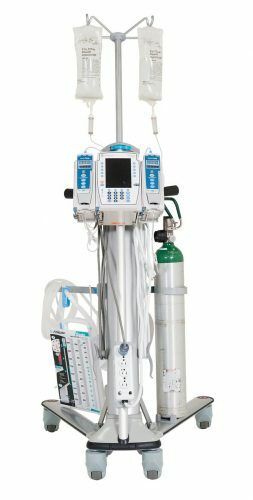 The IVEA was designed to stay with the patient bedside and during ambulation and transport. Ensuring that every patient had an IVEA gave the hospital the best opportunity to improve efficiency and care. Second, they took their education seriously. Caregivers were thoroughly trained on the proper use of the IVEA. A detailed ambulation board on the unit stresses the importance of early and frequent mobility. And clinicians using the IVEA were given ample opportunity to ask questions and get comfortable with the equipment. Third, leadership took a hard look at standard practices around ambulation and made some policy changes to encourage improvement. One simple fix was to add the ambulation-documentation field to the Epic EHR desktop, making it easier to use and harder to miss. Clinicians also use a basic hard-copy checklist to document ambulation – a simple tool that both verifies and validates their performance in this critical area. Early on, the hospital undertaking this study saw the IVEA’s potential to boost efficiency, improve outcomes and lower costs. Their diligent effort to conduct this study paves the way for more hospitals to embrace this transformative equipment. We look forward to updating you on final study results, but also encourage you to act now and start capitalizing on the IVEA’s benefits sooner rather than later. Your patient “Carl”s will thank you. For more information and a product demonstration, please contact us at (970) 472-5323 or info@iveamobility.com.